The world of supplements is interesting and exciting for many, but can often be a vast murky mass of misinformation, one that is difficult to traverse for those who are unfamiliar with the field. For those new to nootropics, feeling comfortable trusting certain products can certainly be difficult. If you are struggling with certain sleeping disorders and the subsequent feelings of grogginess, a foggy brain, and lethargy, you might look into certain nootropics that claim to wake up your brain and provide you with strong mental clarity. There are currently hundreds of nootropics claiming to provide a range of similar effects, including wakefulness and the ability to more easily think and concentrate. Yet many are able to provide such results only through the use of large amounts of caffeine. Caffeine is found naturally in many plants, is consumed by people throughout the world, and is generally considered safe for consumption in moderate doses. However, caffeine has been known to cause sleep disturbances for some, and may lead to nighttime sleep delays and daytime sleepiness. So what can you do if you’re struggling with a sleeping disorder and you’re looking to be awake during the day yet asleep at night? A large amount of caffeine might wake you up during the day for a short period of time, but you might quickly crash, and then be unable to sleep at night. Also, you’re uncertain of which nootropic to pick, and you’re looking for something tested and generally considered safe. During our search we ran across Provigil, which is a prescription medication approved by the Medicines and Healthcare products Regulatory Agency in the UK and the Federal Drug Administration (FDA) in the US. Being approved by both agencies means Provigil went through extensive human trials and is known to be a safe and useful medicine for certain people. Provigil is known as Alertec in Canada, Modavigil in Australia and New Zealand, but Provigil in the rest of the English-speaking world. 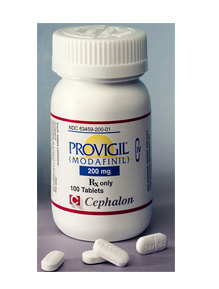 Provigil’s primary agent is Modafinil, which promotes wakefulness in those suffering from sleeping disorders. Provigil is approved by the American FDA to treat narcolepsy, obstructive sleep apnea, which is a potentially serious sleeping disorder where breathing suddenly and repeatedly stops and starts during sleep, and shift work disorder, which is a disorder where your body’s internal clock is out of sync with your work schedule. However, after digging a little deeper with discovered that in August 2010, the European Medicines Agency (EMA) recommended that the uses of Provigil be restricted. A review was made and according to the EMA, the benefits of Provigil outweigh the risks for those with narcolepsy, but the benefits do not outweigh the risks for those with obstructive sleep apnea and those with shift work disorder. The changes were made due to the risk for developing negative skin and psychiatric reactions. Well, for many people in the world, their access to Provigil might already be restricted. Many people struggle with sleep, but don’t have these diagnosed conditions. Despite the lack of access, Provigil has its many fans. It is often used off-label by those with multiple sclerosis, chronic fatigue syndrome, and other disorders where the person might experience fatigue. Provigil is also used by many members of the military as an alternative to amphetamine, which is a chemical that provides humans an energy boost. During combat missions completed by the American Air Force, military members are allowed to take Provigil as a means of staying awake and focused. Also, according to the Canadian Medical Association Journal, Provigil is used by astronauts going on long-term missions as a way to improve performance while suffering from fatigue. Yet we must remind you again, that Provigil is a prescription medicine, therefore you will need a prescription if you want to take it legally. In the US, Provigil is a controlled substance, which means that if you’re caught taking it without a prescription you might get into legal trouble. Provigil is controlled because it can be abused and can become addictive. However, numerous studies have shown that there is a limited chance that Provigil will become abused to the same extent as other controlled substances. Despite the risks, many are clamoring to get their hands on Provigil. It is a very powerful drug that can enhance one’s mental acuity and help you learn and retain information more easily. Therefore many are turning to the streets to buy Provigil and it is well known amongst those on campuses and in the nootropic world. However, we do not recommend this. There are adverse side effects, such as rash, and may not be suitable for those with heart or mental health issues. If you have a diagnosed sleeping disorder and your doctor recommends and prescribes Provigil, then obviously take it under his or her guidance. However, we strongly suggest you do not take Provigil without a prescription, and despite the positive results of many, it just isn’t worth the risk.